Concept: Elegant Financial Services provides comprehensive funeral cover with high levels of dignity and at the lowest cost. How the business idea came about: I saw a sub-serviced gap in the funeral services business and decided to seize the opportunity with my business partner. A former estate agent, Meshack Khoabane began his journey as an entrepreneur in 2014 when he cofounded Elegant Financial Solutions. A company that offers funeral insurance, personalised burial cover as well as professional funeral cover; Elegant Financial Solutions is also an industry innovator. Having recognised a sub-serviced gap in the funeral services business, Meshack and his partner seized the opportunity to take their service offering to an entirely new level with the establishment of the ‘Elegant Funeral Cover’ which is specifically designed to ensure that clients receive significant cash pay-outs more than sufficient to assure families of the dignified service their loved ones deserve at the lowest possible premium. Yet, even with a genuine philanthropic drive and a wealth of great ideas in store, due to slow licensing processes, it wasn’t until March 2016 that Elegant Financial Solutions really began to take off. Shortly thereafter, the reward of patience was paid in still greater dividends with Meshack’s introduction to Seed Academy. 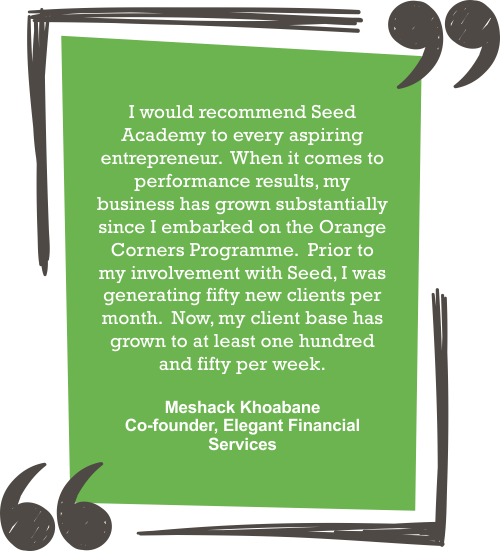 “One of my clients recommended that I get in touch with Seed Academy. As a result, in August 2016, I stepped up my game to a greater level still. I enrolled onto the Orange Corners Programme which I can honestly say was utterly amazing. Right from the beginning, the training and guidance Seed provided really helped open up all my blind spots. Seed Academy really put things into perspective in terms of developing an effective business model that has enabled my business to make its mark in the funeral insurance arena, so much so that my monthly turnover has increased by over 2000%,” says Meshack. “Apart from Seed providing excellent mentorship, what I learnt from the Programme has not only had a huge impact on my business from a financial perspective but in numerous other ways too. To begin, the training provided was invaluable from a management perspective in that Seed greatly helped me to improve my systems as well as to understand the legal aspects of my business. I was also shown how to develop effective pricing models and to understand in detail and take into consideration the costs of acquiring new clients,” Meshack highlights. “I would recommend Seed Academy to every aspiring entrepreneur. When it comes to performance results, my business has grown substantially since I embarked on the Orange Corners Programme. Prior to my involvement with Seed, I was generating fifty new clients per month. Now, my client base has grown to at least one hundred and fifty per week” Meshack concludes. Orange Corners (2016/17) – a joint initiative with The Netherlands Embassy.